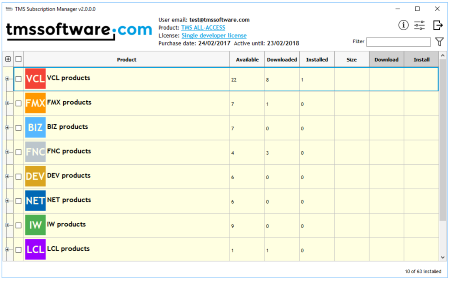 The TMS FMX Component Studio contains the 8 component sets listed here. Set of highly configurable and styleable components for cross-platform FireMonkey application development. Target Windows 32 bit, 64 bit, Mac OS X, iOS and Android operating systems with one-codebase. Seamless access to cloud services from FireMonkey applications. FireMonkey component with extensive configurability for integrating Google Maps in FireMonkey applications. FireMonkey mapping component to integrate, display & control OpenStreetMaps in FireMonkey applications. 100% native iOS components for FireMonkey applications for iPhone, iPad, iPod. No compromises: 100% iOS performance, 100% iOS look, 100% iOS feel components. * Only supports FireMonkey for iOS applications. Set of components for true native Mac OS-X application development. * Only supports FireMonkey for Mac OS-X applications. 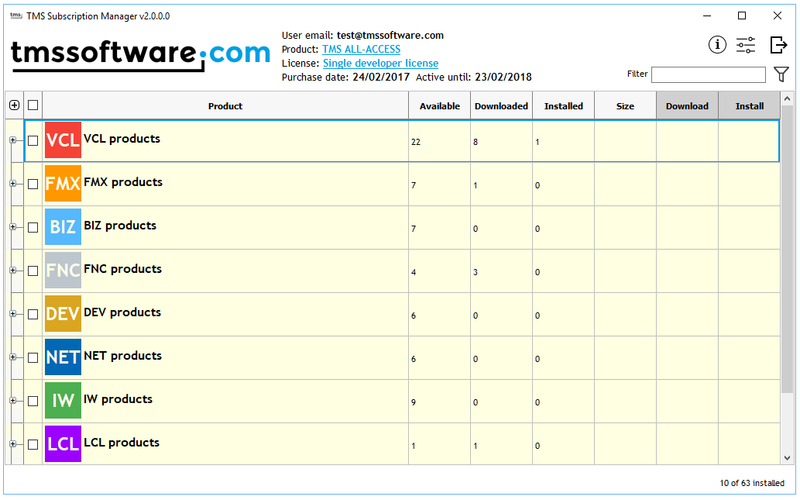 The TMS Subscription Manager can be used for a first time installation of all products after purchase as well as use it to check if updates are available and if so, download and install the updates. Users with an active subscription can obtain the TMS Subscription Manager after login on our website. Fully functional trial versions of each part of the TMS FMX Component Studio can be downloaded from the separate product pages.